Are you part of the “go-till-you-drop” club during the week? Anyone who regularly pushes themselves to work and care for their family until all hours of the night knows what it’s like to miss out on much-needed sleep. You know you’re sleep deprived. You know you should really get to bed sooner, but somehow it never happens. Besides, what’s the real harm, when you can catch up on sleep on the weekend? You might want to rethink your whole approach to sleep after considering the results from a recent clinical trial. Researchers from Penn State University College of Medicine conducted a study to see if weekend “recovery” sleep helped to offset the negative consequences of getting too little sleep all week long. Thirty volunteers were recruited and were asked to follow a sleep-restricted schedule during the week. On the weekends, they were allowed to sleep extra. During the course of the study, the Penn State researchers measured the volunteers’ health and performance by conducting a series of tests. The researchers discovered that the sleep-restricted week caused increased fatigue in the volunteers. However, after getting the extra sleep on the weekend, the sleepiness disappeared and volunteers appeared to return to “normal”—so far, so good. Then the researchers measured a marker for inflammation found in the blood: it was higher during sleep-deprived periods but returned to normal once the volunteers had their weekend recovery sleep. A marker for stress was measured as well. This hormone didn’t change during sleep restriction but did drop significantly during the recovery sleep. Now—here’s the bad news: the volunteers scored lower on performance tests when sleep deprived—an effect that did not disappear with extra sleep time on the weekend. These results may be important if you’re cutting short your sleep during the week. An extended recovery sleep on the weekends might not be enough to help you recover and perform at normal levels. In particular, the research team noted that the volunteers did not recover their ability to pay attention, even after the recovery sleep. This attention deficit could affect you over the long term. You may not be able to understand, process, and learn in situations that require your full attention. Try to get eight hours of sleep every night so that you can remain alert. 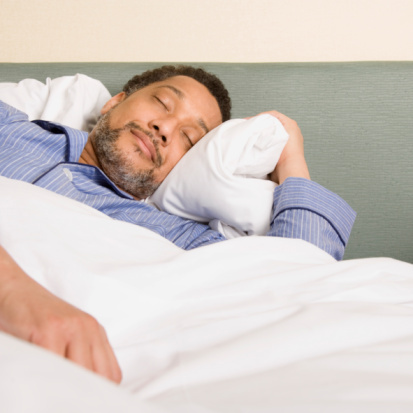 There are certain strategies you can use to get more sleep during the week. First of all, try to organize your day so that the end of the day remains free. Being able to relax an hour before bed can help you unwind. That way, when you do hit the sack, you should be able to fall asleep quickly. One other important strategy for getting more sleep is to ask others for help. Don’t try to do everything yourself, or you will be setting yourself up for a very long day indeed. Delegate if you can and take the hour you save to get an extra hour of sleep. “Sleeping in On Weekends Doesn’t Fix All Deficits Caused by Workweek Sleep Loss,” Science Daily web site; Oct. 9, 2013; http://www.sciencedaily.com/releases/2013/10/131009125740.htm, last accessed Oct. 18, 2013. Pejovic, S., et al., “Effects of recovery sleep after one work week of mild sleep restriction on interleukin-6 and cortisol secretion and daytime sleepiness and performance.” AJP: Endocrinology and Metabolism 2013; 305 (7): E890.